“Adulting” is an irritating word for a relatable concept. Those among us lucky enough to have enjoyed idyllic childhoods are naturally reluctant to leave them behind for the drudgery of the grown-up world. Brie Larson, who makes her directorial debut with Unicorn Store, has been a working actress since the age of 9; whether that childhood counts as idyllic, only Larson really knows. But there’s something that drew Larson to this story of an art-school dropout stuck in a state of wide-eyed naïveté well into her 20s, a woman old enough to have a temp job at a marketing agency who surrounds herself with stuffed animals and sits at her cubicle doodling magical woodland creatures. In fact, Kit (Larson) is childlike enough that you wonder if she’s living with some sort of developmental disorder. Either that or her parents, Gene (Bradley Whitford) and Gladys (Joan Cusack), who run a therapeutic camp for troubled teenagers, are so devoted to their work that they’ve completely neglected to tend to their only daughter’s emotional well-being. Neither of these threads are explored in the film, which treats Kit’s extreme innocence—Was she home schooled? Did she spend a few years in a hospital, maybe?—as a priori fact. Of course, cynically searching for the dark underbelly of any situation is a very adult state of mind, and nothing about this film is adult. That’s by design, as Larson has filled Unicorn Store with rainbows and soft pastels, whimsical costumes, and gently satirical digs at corporate and consumerist culture. The cohesion of look, tone, and Larson’s performance as Kit—she gives off the vibe of a little girl in a pair of her mother’s high heels, pretending to be a glamorous adult woman—all point toward her promise as a director. And the script, from sitcom writer Samantha McIntyre, is full of amusing side jokes and one-liners, even if some of them steer dangerously close to sassy-greeting-card territory. But unlike, say, Mike Leigh’s Happy-Go-Lucky, which makes a point of underlining the tension between its starry-eyed protagonist and the rest of the world, Unicorn Store is so myopically intent on creating a whimsical bubble for its protagonist to live in that it ends up trapping itself inside. The basic, high-concept premise is that just when Kit gives in to the pressure to grow up, her childhood dream comes calling. Or rather, it arrives in the mail, in the form of an Instagram-ready personalized invitation to come and visit a place simply called “The Store.” Once inside, she is greeted by “The Salesman” (Samuel L. Jackson, in a truly puzzling wig), who presents Kit with a tableau of immature delights that seems to have been assembled just for her. Then, he drops a bit of information that would make any horse girl’s head explode with delight: This isn’t just any store. It’s a unicorn store, and once he’s completed the paperwork, he’s got a unicorn just for her. No catch, she’s just got to put on her Tinkerbell wings and believe. That’s not to say that there aren’t pleasant aspects of this terminally perky film: Larson’s assured use of color and tone effectively evokes a particular moment in girl-culture time that may prove powerfully nostalgic to older millennials. And the comedic chemistry between Larson and Jackson is as effective as it was in Captain Marvel—it’s fun to think about these unlikely BFFs hanging out and eating ice cream. 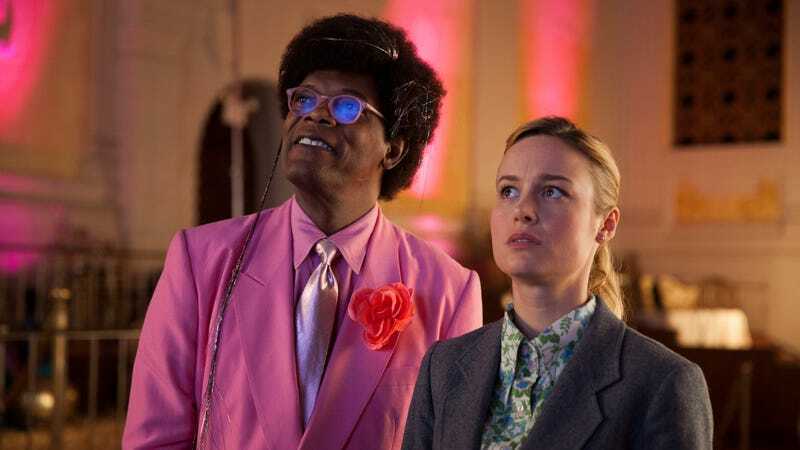 Still, there’s a reason that Unicorn Store, which premiered back in 2017 at the Toronto International Film Festival, is only coming out now, after the release of the aforementioned MCU blockbuster. It’s a candy necklace of a movie: sweet but chalky.